The post discusses how both aspiring and advanced traders can create a trading mastermind group to rapidly improve performance. A trader working at a sophisticated Wall Street trading firm is surrounded by a highly-refined support structure aimed at nurturing the trader to higher and higher levels of performance. A floor manager and risk manager are there to keep a watchful eye on position sizing and process. Traders are often paired with a senior trader to act as a mentor. Fellow traders provide camaraderie and support when tough times hit and to celebrate the successes. In short, the trader is part of a Team and experienced teammates are there to help each other succeed. Question: Do you have a motivated team surrounding you that is there to facilitate your success? That’s what I thought. Life as an individual trader is often lonely and frustrating; devoid of both camaraderie and professional nourishment. Who do you talk to about trading? I’m not talking about banter in trading chat rooms. I am talking about serious discussions about serious issues affecting your performance. To whom are you accountable? Who do you review trades with? Who guards your money? Operating within a totally unstructured, unsupervised environment seems like paradise, but after you take off the rose -colored glasses, it isn’t the most productive environment to truly grow as a trader. What can you do about it? This is where the idea of creating a mastermind group comes in. Napoleon Hill , in his 1937 timeless classic, “Think and Grow Rich” first coined the term “mastermind group” to describe a small group of like-minded people using their collective knowledge and effort toward a definite purpose in the spirit of harmony. Like a good Board of Directors, Mastermind Group participants challenge each other, and the group in general, to create goals, implement plans of action, provide critiques and support each other with honesty, respect and compassion. Mastermind Group participants act as catalysts, bringing energy, passion and commitment to the table. What if you could re-create that Wall Street trading environment for yourself. What would it be like to have an experienced trader available to ask questions? Would you enjoy and benefit from having a few trusted peers to bounce trade ideas off of or to review recent trades? Can you envision rapidly growing as a trader if you were surrounded by people that were both pushing you to be better and giving you ways to do it? Just like a professional athlete with their entourage of people that help them perform to their maximum potential, you’ll have your own team focused on your success. Let’s just do it!! 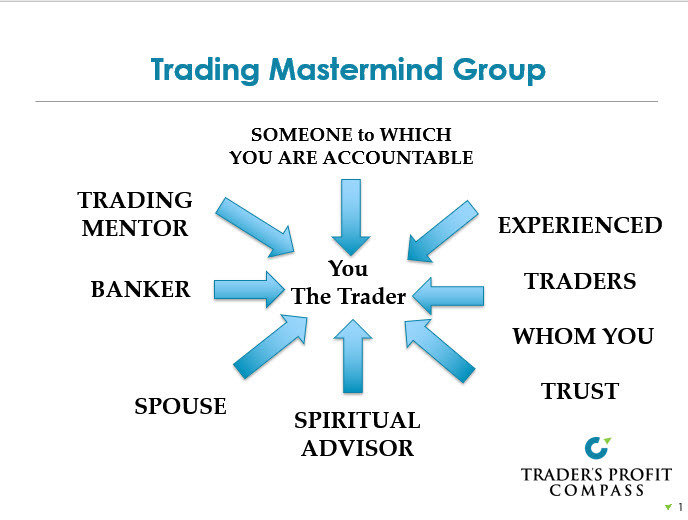 Here is a picture that shows the roles I feel need to be filled in order to have a well-rounded and effective Trading Mastermind Group. If you’re relatively new to trading, the worst thing you can do is fund your trading account with your nest egg. That is a great way to get wiped out. What you need is a Banker to protect your money from yourself. This is the equivalent of a Risk Manager on the trading floor. Do you think a new trader is simply handed a $500 million trading account when they show up at Morgan Stanley’s commodity desk? The Risk Manager protects the firm’s money. If you deliver results, you get more money to trade with. Your Banker literally has to control the money, because if you can get to the cookie jar whenever you want, you will. Your Banker could be a spouse, a sibling, a parent, or a trustee at your bank. It doesn’t matter. You just have to trust them. You can create the criteria by which you are allocated more trading capital and when you are cut off. Mindset is one of the 4 pillars of successful trading. ( If you want to learn more about them, and have an hour, watch my video HERE ) Any trader that has been around the block a time or two should be able to tell you that at least 80% of successful trading is mental. Traders do not conquer the market, they conquer themselves. Behaviors like ignoring stops, insane position sizing, selling winners and holding losers have literally NOTHING to do with the market. They have to do with YOU. To solve these tough issues you’ll need someone in your mastermind group that is good at helping you sort through all the personal demons that manifest themselves in your trading. This is the hardest work you’ll ever do and its the kind of work 90% of aspiring traders neglect. And guess what? Those traders will fail. Your Mentor will be able to help with some of the issues, but often times a more clinical approach is needed. A resource like this will be so valuable in your development as a trader. Identify and develop relationships with 2 or 3 fellow traders whom you respect and are willing to share time and experiences with you. It would be nice if they had a little more experience than yourself, but it isn’t mission critical. These persons may already be trading buddies or traders whom you interact with online. When you approach them, be clear about what you’re asking them to do and what you’re prepared to do for them. Maybe its simply an open line of communication. Maybe its and hour or two a month to review past trades or potential ones. You should be able to tell right away if the relationship is progressing. If you are not comfortable, graciously back away and go back to being online buddies or whatever. You should be able to find a couple guys or gals that would enjoy being on your team. Maybe you can be on their team as well. If you’re unattached but don’t plan to be that way forever, you may still want to absorb this section. Achieving trading success is a long hard journey which will demand sacrifices of both yourself and the person with whom you’re sharing a life. It’s vitally important for them to be a part of your team. Your partner deserves to see how hard you’re working, to see you struggle, and to see your progress. They should understand that you’ve instituted safeguards for your nest egg and that you’re being responsible with your collective monies. A failure to bring in your partner opens the possibility of losing them when times get really tough. You wouldn’t be the first person to succeed at trading but lose their family in the process. A hollow victory at best. The flip side is that by including your significant other in your trading life, you’ll not only grow as a trader, your relationship will grow right along with it. In my experience, being accountable to yourself doesn’t work. The brain is a conniving organ. It will do anything to protect your ego. It will twist and manipulate circumstances so you feel warm and cozy. It will shape the narrative you want to hear and that’s a dangerous thing as a trader. You need a 3rd party for that responsibility. In my mind, it should be either your spouse, mentor, or banker. You just need to be comfortable getting into the nitty- gritty and being called on the carpet by them for short comings. I don’t think the role is appropriate for a trading buddy or professional counselor. I believe that filling the above roles will surround you with a high-performance team that will accelerate your advancement as a trader. Realistically, you won’t be able to fill out your team in a week or two. It will take time. There will be hits n misses, fits n starts, but regardless of the potholes, keep at it. Over time you’ll be able to pull together the right people and iron out a workable schedule to meet with the different elements of your Mastermind Group. In a future blog post, I will provide some tips and tricks on how to get the most out of your Mastermind Group. These ideas will help you leverage the talent you’ve surrounded yourself with. In the meantime, start looking to find participants for your group. I truly hope that you put a mastermind group to work with and for you. I think you’ll be amazed at the rapid progress.